There are many types of snowboards out there, and to understand why, first we need to have a basic understanding of how a snowboard works. Snowboards can be made in many different ways, traditionally they have a wooden core, but some of the newer composite boards have no wood in them, and are made largely from carbon and other composite materials. 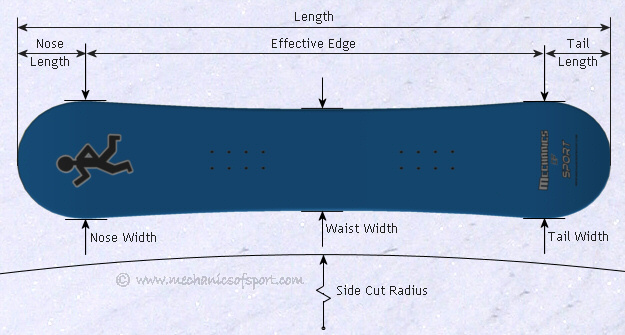 Below the parts of a snowboard are described, with explanations of what they do. The base is the area on the bottom of the snowboard that comes into contact with the snow. Generally when looking to buy a snowboard this will not be something you will consider that much, although it is a very important part of the snowboard. Bases are made of P-Tex a polyethylene plastic, and can vary in many different ways. There are different qualities of P-Tex, extruded and sintered constructions, and different additives that can be used. This makes different types of bases have different properties, which can make them faster, stronger or able to hold more wax than other types. The different types of bases and there properties are covered in more detail in the Snowboard Construction page. Quickly summed up, sintered bases are superior to extruded bases as they are more durable, faster and hold wax better, but at the same time are more expensive and difficult to repair. The best types of bases are sintered hybrids that have graphite and other materials in them, they hold wax even better and are even faster. They are always a dark black colour, and are normally only found on racing snowboards. When a base is ground (sanded down on a machine) it will be left with slight grooves running along the length of the snowboard, depending on how deep and far apart these grooves are, it makes the board better for different snow conditions. Generally the deeper and further apart the grooves are, the better it will be in wetter snow. Most boarders however use their snowboards in all conditions, and are fairly unaware of the differences base structures can make. The thing that makes the largest difference with the base in keeping it fast and in good condition, is to keep the base well waxed. There are also many different types of wax you can use, usually suited to different temperatures of snow, although some also have different additives in them. 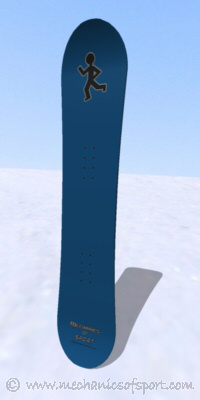 These are also covered in more detail in the Snowboard Construction page. The base of a snowboard can get scratched if it goes over objects such as stones etc. For general snowboarding as long the board is kept well waxed, the amount of scratches on the bottom will not make much difference. Although if you do have large scratches, it is best if they are down the length of the board, and are not too close to the edges. The edges are the metal strips that run down the side of a snowboard. Edges are very important, and can make a big difference to the performance of the board. There are many things that effect the edges and how they work, like sidecut, sharpness and stiffness (stiffness is explained more in it's own section). Lets look at the sidecut firstly. If you look at a snowboard you will see that it is wider at the tips than the middle. This is because the edges have been shaped so that they curve along the sides. 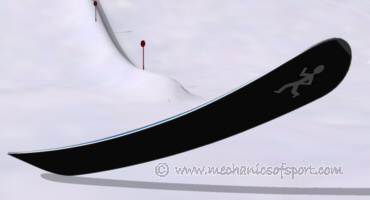 If the snowboard is tilted onto an edge, this curve will try and lead the snowboard around in a circular path. The curve on the edge of the board is called the sidecut, and will have a sidecut radius which is determined by the effective radius that the curve has. A board with a smaller sidecut radius will make smaller tighter turns, whereas a board with a larger sidecut radius will make larger turns. The radii on snowboards are normally between 8 and 10 meters, somewhat smaller than on skis. Progressive (Bi-Radial) - The sidecut is made from a longer radius curve at the front of the edge, blending into a shorter radius curve at the back. This gives a smooth entry into a turn with acceleration out of it. Quadratic - The sidecut is made from a longer radius curve at the front and back of the edge, blending into a shorter radius curve in the middle. This gives a turn a smooth entry and exit, with acceleration through	the	middle. How sharp the edges on a snowboard are makes a big difference with cutting into the snow. Edges that have just been sharpened will have less resistance and cut into the snow better than edges that haven’t, giving you more edge control. Also the angle that the edges are sharpened at can make a difference. Most snowboards will have edge angles of 90 degrees but if you are looking to increase the grip you have on icy snow, taking the edges to 88 degrees can make a fair difference. Having edges sharper than 88 degrees is not advised unless you have an alpine board (racing board) though. On a snowboard each edge can be referred to individually as either the toe edge, or heel edge. The toe edge is the edge on the board the same side as your toes and the heel edge is the edge the same side of the board as your heels. Often the heel edge will wear down more quickly than the toe edge as people spend more time sliding and stopping while looking down the slope with the heel edge in the snow. If a board is changed from regular to goofy though, the heel edge will change to the toe edge and vice versa. Generally the stiffer a snowboard is the more responsive it will be, the better it will be able to hold an edge in hard packed snow, and the better the handling will be at higher speeds. This all sounds very good, but also the stiffer a snowboard is the less forgiving it will be if you make any mistakes. Freestyle snowboards are generally quite soft as they need to be a bit forgiving, and the flex makes tricks easier to do. Snowboards intended for higher speeds and responsiveness will be stiffer. Heavier riders also need a slightly stiffer flex, with lighter riders needing a softer flex. 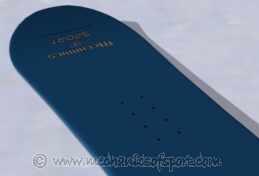 Snowboards are also made with different flex patterns, this is how the stiffness of the board changes along its length. Some boards will have the symmetrical flex along their length so that they are the same to ride in either direction, whereas others might have a directional flex, for example with a softer nose to help deal with bumps and a stiffer tail to increase the pop you get in an ollie. The amount of camber a snowboard has is measured by the height the middle of the snowboard sits above a flat surface when there is no weight put on it. In general more camber gives a snowboard more pop, which makes a snowboard more lively, and lets you jump between turns more easily/energetically with better edge hold. You still don’t want too much pop as then the snowboard would be too lively and hard to control. Snowboards are shaped like this so they push into the snow along their entire length. 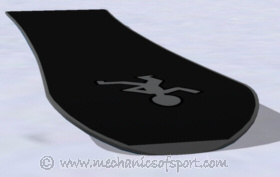 This shape means that when the rider is on the board the ends of the snowboard will always have a force pushing them into the snow, keeping the entire length of the edges in contact with the snow. Stiffness also plays a large part here, the camber shape is what keeps the length of the snowboard pushing into the snow, but it is the stiffness that determines how hard the ends push. So although although camber is measured by the height the middle of the snowboard sits at, the liveliness and edge hold it creates is also very dependent on stiffness. Many newer freestyle boards are coming out with negative camber (a rocker shape), or other shape variations. This goes against the traditional snowboard design, but it does let the snowboard spin more easily without the edges catching. These new camber types are gaining popularity very quickly, the different shapes that are being used are covered in the Newer Snowboard Concepts page. The width a snowboard should be for someone is generally decided by the size of their feet. 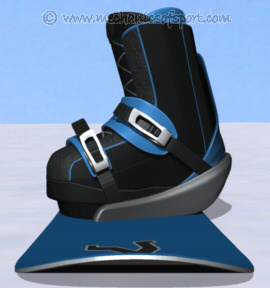 Ideally the toe and heel of a snowboard boot should come about 1.5cm (1/2") over the edge of the board, this enables a good amount of pressure to be put on the edges of the board, but without the toes or heels dragging in the snow. This means that people with bigger feet need wider snowboards. Because of this many snowboards come in slightly different versions, having a normal version and a wide version. Although having a wider snowboard might be good for your foot size, it does make it harder to switch from edge to edge, as your body has to move further to transfer pressure between the edges. Another solution to buying a wider board if you have large feet is to put power plates on the snowboard. These raise the bindings up higher off of the board so that larger feet won't drag in the snow so easily, and also make it so you can apply more pressure to the edges. The length a snowboard should be, is determined by the height, weight and ability of the rider, and the type of snowboarding they wish to do. Obviously the taller and heavier the rider is the longer the board will need to be, but this needs to be balanced with their ability and style of riding. For freestyle the board should be shorter as a shorter board spins more easily and is more maneuverable. For carving and off-piste snowboarding, the snowboard wants to be longer, for stability at higher speeds and floatation in the powder. 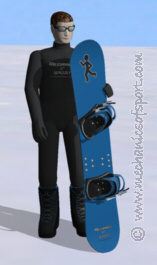 For general all-mountain snowboarding the board should be a medium length to give good all-round performance. Snowboard lengths are measured in centimeters. A general method to work out how long a snowboard should be is shown in the table below. Weight How heavy are you for your height? Riding Style What is your riding style preference/bias? What you are left with should be a good estimate of the board length that would suit you the best. Don't take it too precisely though as it is still only a rough guide. Snowboards longer than 168cm are hard to find and are generally intended heavily for off-piste riding. Snowboards have several sets of holes built into them for mouting the bindings. There are several holes so that there are many different positions that the bindings can be mounted. Most boards use the standard 4 hole system for mounting bindings, although there are systems that only use 3, and you can also get rails where the holes slide up and down the board along a track. Freestyle Snowboards - Intended for tricks, jumps and rails, freestyle snowboards generally have a symmetrical shape (twin-tip) making them good for riding in both directions. They have a moderate to soft flex giving them a forgiving feel, with a deeper sidecut for quick turning. Freeride Snowboards - Intended for riding fast on hard packed snow and in soft powder. Freeride snowboards generally have a wider and longer nose than tail, which helps them float in the powder. The bindings are also set back which makes them semi-directional, and not as stable riding backwards. They are normally of a moderate to stiff flex, giving them more edge hold and greater stability at higher speeds. All-Mountain Snowboards - Intended for a bit of everything, these boards are a hybrid of freestyle and freeride snowboards, giving them reasonable performance in all areas. Their characteristics can change a lot depending on the board, a lot of boards are biased towards freeride or freestyle making them similar to that style of board but with less extreme properties. Alpine/Racing/Freecarve Snowboards - Intended for carving and racing, these boards are long, stiff, narrow and have a directional shape. They are generally used with hard boots and plate bindings, and hold an edge at higher speeds better than any other type of snowboard. This site does not really cover the different equipment that is used with them other than mentioning it, although the snowboarding techniques are very similar. Split Boards - Theses boards are made of two pieces that can be split apart and turned into skis for hiking up slopes, and then bound together to make a snowboard for riding the powder back down. Obviously the mechanisms that bind the pieces together do add weight to the board, but they are very good and adaptable option for snowboarders who like to hike for their powder. Swallow Tail Snowboards - Intended for riding almost exclusively in powder, these snowboards have a V-shape cut into the back of the tail, which makes the tail easier to sink in powder. These are the best boards for riding powder with, as long as you only want to go forwards, but due to them being so specialized, they are not so common. On to the Snowboard Bindings section, or the Snowboard Construction page if you would like to know about how snowboards are constructed.